Google My Business posts have been around since mid-2017. 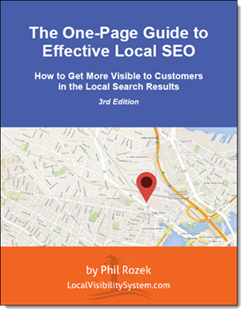 They seem to have caught on – more than many of Google’s “local business” features have – mostly because the payoff is clear: GMB posts stick out in your brand-name search results, and can nudge people toward the next step you’d like them to take. Should you use Google My Business posts – for your business? On the one hand is the “Why not?” argument. You can give GMB posts a try for a few months and see if they’re worth the (small) effort. 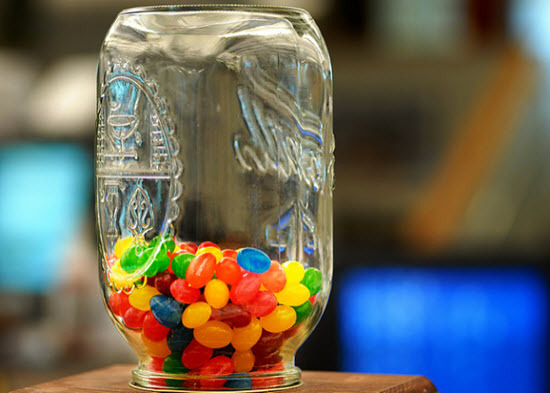 If most businesses use GMB posts already, won’t customers tune them out? If few businesses use GMB posts, have most business owners just concluded they’re a waste of time? If few businesses use them, will Google retire GMB posts soon? You probably don’t need another distraction – another thing to keep you from focusing on the stuff with clearer payoff to your local visibility. This is where it helps to know specifically how many businesses use – or ever have used – Google My Business posts. I couldn’t find any numbers on that, and when possible I like a better understanding than, “Umm, not many” or “A lot, I guess.” So I did some research. I looked at 2000 businesses in the Google Maps results, in 100 local markets. Those 100 markets covered 10 cities across the US, and focused on 10 categories of businesses. (More on my methodology in a minute.) I counted how many businesses had created a GMB post recently – within the last 7 days – and how many businesses had ever done a GMB post. Q: How many businesses have ever created a Google My Business post? Q: How many businesses have posted recently and seem to post regularly? Q: How many businesses posted at least once, but seem not to keep up with it? Q: Of the businesses that do post on GMB, how many seem to do it regularly? A: About 1 in 4. Q: In how many local markets has at least one business (in the top 20) ever tried GMB posts? A: About 91% of local markets. In only 9% of markets (that I looked at) nobody had ever posted. Q: In an average first page of “Maps tab” results (20 local businesses), how many have ever tried GMB posts? Q: How saturated do local markets get, in terms of how many local businesses post on GMB? A: The most I ever saw was 10 businesses out of the top 20. There were a few nines and a few eights. Again, the vast majority of businesses I looked at have never posted. You can download my spreadsheet here. If you look at it, I’d love to hear any insights you glean that I didn’t mention. 1. I looked only at businesses in the US. I imagine the adoption of (or dabbling in) GMB posts is a little lower outside of the US, but of course it just depends on the local market. 2. I looked only at larger and medium cities in the US. In some cases Google Maps drew results from the suburbs, but I didn’t search there or in less-populated areas. In my experience, adoption of Google My Business features (and the like) is lower outside of the larger cities. 3. I searched in Google Maps – in the “local finder” – so I could look at a larger sample of businesses. The alternative was to look at the top 3 businesses on page 1 of Google’s main search results, but Google’s main search results don’t show who’s using GMB posts. I’d have to click on each listing anyway. In the “Maps” view, I could pull up a list of 20, and very quickly check each business and see whether it had any GMB posts. 5. What about the red search terms on my spreadsheet? Those represent cases where the search term I originally chose (e.g. “Boston animal hospital”) didn’t produce a full page of 20 businesses in Google Maps. That would have shrunken the sample size a little, and skewed my data a little, so in those cases I just picked a different search term – one that did pull up 20 businesses on the first page of Maps. 6. Over time the number of businesses with a “fresh” GMB post (i.e. posted within the last 7 days) may decrease, or just not grow as quickly as the % of businesses in the “stale posts” column. The reason is simply that most businesses don’t stick with posting on GMB. Today’s business with a fresh post is next week’s business with a stale post. 7. Which categories of businesses post the most? I don’t know, because I’d need to have looked at all or at a couple hundred industries. But I can say that, of the categories I looked at, dental practices seemed the most post-happy. 8. How closely does GMB-posting activity correspond to rankings? I don’t know, because that wasn’t what I set out to find out here. That’s a discussion for another day. In any case, it would be tough to say, because a business owner who bothers to post on GMB probably has other local SEO irons in the fire. 9. 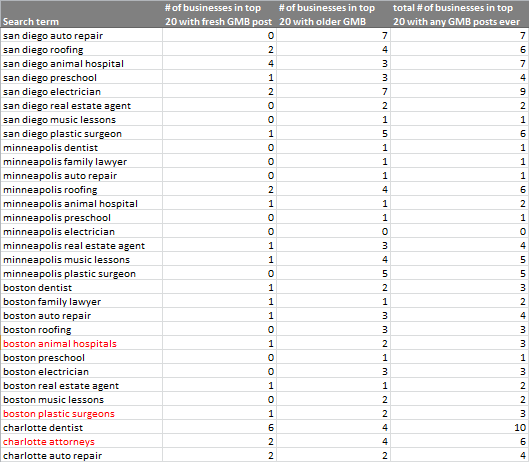 What about the businesses that didn’t even make the first page of Maps results – the businesses ranked #21 and lower? I didn’t look at those. I suspect they post a little less than do businesses on the first page of Maps. Most businesses don’t keep up with Google My Business posts. 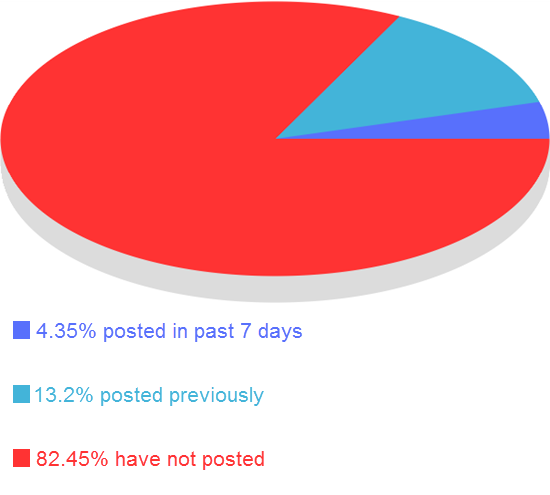 Of the businesses I looked at, only 4% had posted within the past week, versus 13% that had posted at one time or another (less recently than within the last week). They don’t keep the posts coming. Google’s mother-hen reminders don’t work too well, apparently. Because Google sends you a reminder every time your post is about to “expire,” my guess is business owners think that creating a new post is a big chore and a pain. Maybe they have few good photos to share, or they think a GMB post needs to be like a Facebook post. Or maybe they choose to post every 2 weeks. In any case, Google should add a “re-post this post” feature, or something like that. Customers aren’t drowning in Google My Business posts (at least not yet). Do some businesses post too often? Yes. Are most posts well-done and worthy of searchers’ and customers’ attention? No. But most businesses haven’t overdone GMB posts, because most businesses (over 82%) haven’t used GMB posts. Given how hard Google is pushing GMB posts, if there’s ever a time to give them a try, I’d say that time is now. 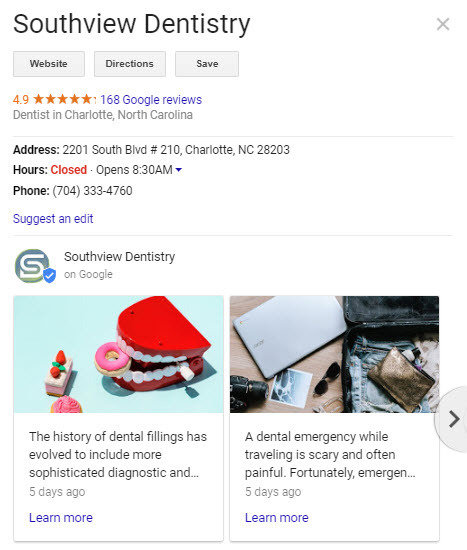 Enough businesses seem to use Google My Business posts that Google probably will keep the feature around, and maybe add to it over time. 17% may not sound like a high percentage. But if my cross-section of 2000 businesses is at all representative, then many millions of business owners have tried GMB posts at one time or another. Google often kills off products and features both popular and unloved, so we can’t assume GMB posts will be around forever. But when I think of how slowly most business owners adopt new features, and how (relatively) new GMB posts are, I’d say the chances are good GMB posts will stay out of the Google graveyard. Any researchable numbers or facts you’d like me to cover? If you’ve looked at my data, did you reach any different or additional conclusions? What’s the lowdown on Google My Business posts in your local market? That’s not bad, Andy. It’s about the same with my clients (so far). Great research and great article. Thank you. I just don’t see the return-on-effort ROE for this, given limited resources. Thanks for saying so, Chris. I suspect the ROE depends on many things. 1. You get to CONTROL what is page one on Google … how else can you do that?!? We use Google Posts quite frequently, in fact every 7 days or less. Google sends out an email alert, and an alert in GMB to let you know your post is about to expire. Post another please. And the good thing is, you can post as often as you like. It even allows you to select a button for a call to action. The only thing I don’t like, is it is only 300 words or less, and you can’t use any HTML in it as far as I know. But, I think it works! Looks like you’ve kept up with the posts pretty well, Sherm. Google sure wants us all to. My guess is it’s all a big test: that Google wants to see which calls-to-action really get people to click, so that Google eventually can incorporate those more into the paid results. The big question, of course, is how much posts you (and me, and everyone else) in the meantime. Oh, btw, Great Article as usual Phil. You seem to have all the great resources available for everything Google. Glad that you are there and doing what you’re doing for the little ants out here in the Google Jungle. For enterprise, 200+ locations, it is a challenge to publish Google Posts as there are no bulk publishing options available. But we do anyway, often for a limited number of locations because of the manual effort involved in publishing GPosts. I hope in time that G will have administration tool that drives efficiencies into this process. I appreciate your insights. That sounds like a lot of effort, for sure, but also a great opportunity to test out a ton of messages, calls-to-action, etc. Each of those 200+ locations is a petri dish you can experiment in and figure out what works. Once the payoff is clearer, the effort is more justified. Oh, I forgot to mention, they now have Google Bookings. I noticed it yesterday in Beta presentation, where a customer can actually book an appointment for services right through GMB. That booking feature has been around since last year (https://www.blog.google/outreach-initiatives/small-business/easy-booking-button-businesses-google/), but I’ve been seeing more of them, too, and I suspect Google will only expand the program over time. Hi Phil, I’ve used Google posts for our Seattle area dance school. We are in a very competitive local market here and Google search results are very important. Given that we never know if, what and when Google is looking for ranking signals, I err on the side of total cooperation. Anything I can do to please the Google Gods short of sacrificing my kids is fair game. I really appreciate your emails, Phil. I get 20-30 a day but open yours asap. The advice is always timely, practical and immediately applicable. Please keep up the good work. That’s good SOP: doing the steps Google nags you to do, on top of the things you know to do anyway (e.g. earn links). The agent just started doing posts about a month ago, and the clicks were on posts where he was displaying a listing to sell. I've been posting for the repair shop since June 2017 and the most recent post is the only one (out of 22 so far) that has received a click. That particular post was displaying a customer review. Many factors will determine the results you will get with you or your clients posts. You just have to try out different photos, backgrounds w/text, descriptions and call to action buttons. Also, consistency in posting, as was mentioned in the article. 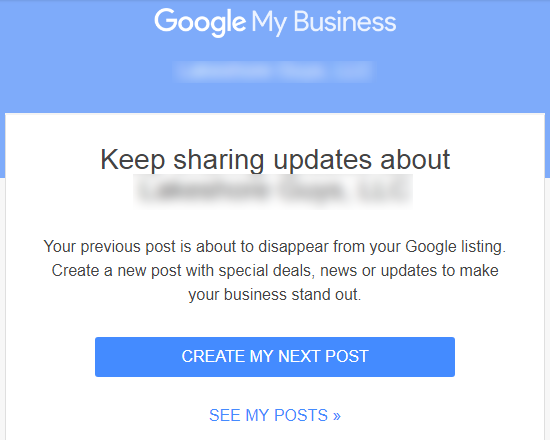 I didn't see it mentioned in the article, but Google is now showing in the GMB Dashboard a section labeled "Businesses like yours are posting" with about 10 posts from other businesses in the area. This may give us a hint of how Google is looking at the efficacy of posts… only time will tell though. Thanks for the crunchy bits of intel. Everything you say pretty much squares with what I’ve found. It sure is tough to know what will get any attention before you just try it. Correct: I neglected to mention the “Business like yours are posting” section. Great point. It’s yet another way Google coaxes us to post, though it might also provide some good rough benchmarking.